Since then, I’ve learned more about flag etiquette than I ever did. While I do not pretend that the president will listen to anyone to brush up on the basics, I hope the average American is smarter than that. Many closet racists joined the president in criticizing the black players for what they called disrespect of the flag. So let’s see what is and what is not right. The American flag code is defined in Title 44, United States Code, Chapter 1, which is far too long to reprint verbatim in this column. Section 8 covers respect for the flag. Did you know the flag should never be carried flat or horizontally, but always aloft and free? Gee, have you noticed that, at NFL games, the league parades the flag in flat? Not aloft and free by any means. Perhaps you didn’t know the flag should never be used for wearing apparel, bedding or draperies. Or did you? Do you realize the flag should never, never be used for advertising purposes in any manner whatsoever? Nor is it to be used for anything that is for temporary use and then discarded. The flag represents a living country and is itself considered a living thing! The code, which is five and a quarter pages long, details a lot more specific do’s and don’ts. Since the flat flag that the NFL parades out before football games does not comport with flag etiquette — a clear violation — it’s difficult to see how anyone “disrespects” this already inappropriate use of the flag by respectfully taking a knee. Bikini bathing suits, T-shirts, slacks, cowboy shirts and clothing of all types make use of parts of the flag as part of their design. Just look around the stores right now. Furniture, drapes and all kinds of indoor and outdoor decor show off full or partial pictures of the flag. All are inappropriate and forbidden by the Flag Code. Think of all of the print and TV ads for Memorial Day sales that included the flag, in part or in full! All are violations of the Flag Code. So are images of the flag printed in the newspaper before the Fourth of July — a temporary use that will soon be discarded. I could go on and on about what’s in that code. But it’s best for each of you to look it up in its entirety. Please do. You will be surprised what is banned. 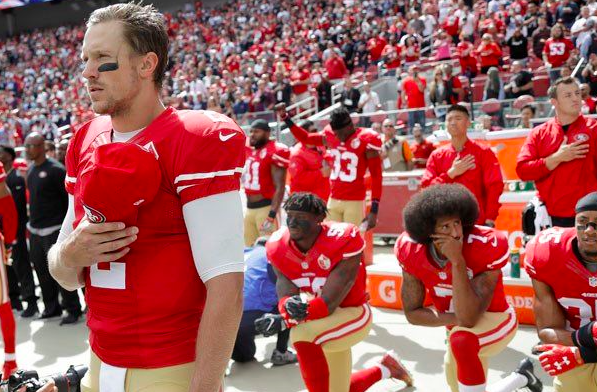 So if our president, instead of attacking black football players, would read Title 4, he could spend the final days of his first term tweeting about all of the disrespect being shown the flag by those who improperly display it here, there and virtually everywhere. Of course, that would mean he’d have to attack some big companies whose support he needs, and he’d also have to read. It’s hard for me to think of this president in an article discussing our flag because I have so much respect for the flag and the men and women of our military who gave their lives defending it. While Memorial Day celebrates those who died in combat, I can’t help but think of the one American hero who did not die but spent years in captivity. He came back to serve his country with honor and distinction. I refer, of course, to U.S. Sen. John McCain, who is nearing the end of his service because of a brain tumor. When he was campaigning against then-Sen. Barack Obama, an elderly woman questioned his opponent’s birth certificate and racial background. Sen. McCain gently stopped the lady in her tracks and told her the story was not true … and that while he and Sen. Obama had different political opinions, he (Obama) was a good and decent man. Decency at the highest level is hard to come by these days. I still can’t understand why the GOP leadership at all levels did not uphold the honor of that true American hero when he was attacked by some not fit to tie his shoes. But it is what it is: A real hero who was vilified by those who (history will show) failed the test of decency when it was on full display and badly needed. I respect the flag. I honor Sen. McCain. Amen. RON SCHALOW: Prevaricator Port — Featuring New Lies! Great points, Judge. Thank goodness and decency that the bottom of the war on being civil and respectful in this nation was reached when ABC courageously and correctly fired Roseanne Barr and canceled her show. It seems nobody on the “right” wants to bring this country together when, in fact, Mr. Trump did not receive, by over a million, the majority of the popular vote. We must work to stop this continual slide into vulgarity in our public discourse, just as ABC did this week. Thanks Larry—we have a lot of work to do. Michael Avanati (not sure of the spelling) is going gung ho to stop President Slime.